Well, ice cream is the something that anyone’s childhood was obsessed sweetly. It’s funny to say that I use to keep my 3 year old child to her favor in eating by ice cream. And this one is the most favorite ice cream she likes. The taste of brown sugar is uniquely sweet like honey that you should try making this cold dessert for your child – not only the small child but someone that is totally big but still loves your everyday’s saying “my baby”. – In a 1.5 quart sauce pan, melt the butter just until it becomes liquid. Add 1 heaped cup of dark brown sugar in a low heat. Stir the sugar evenly in a low heat help preventing the burning of sugar. – Wait until the sugar totally being melt down and become caramel. This process is relatively annoying ‘coz the butter would resit the melting process of sugar. Anyway, keep patient for 2-3 minutes for a total melting and increase the heat to medium until you can see the caramel has the smell of smoky but not too dark. 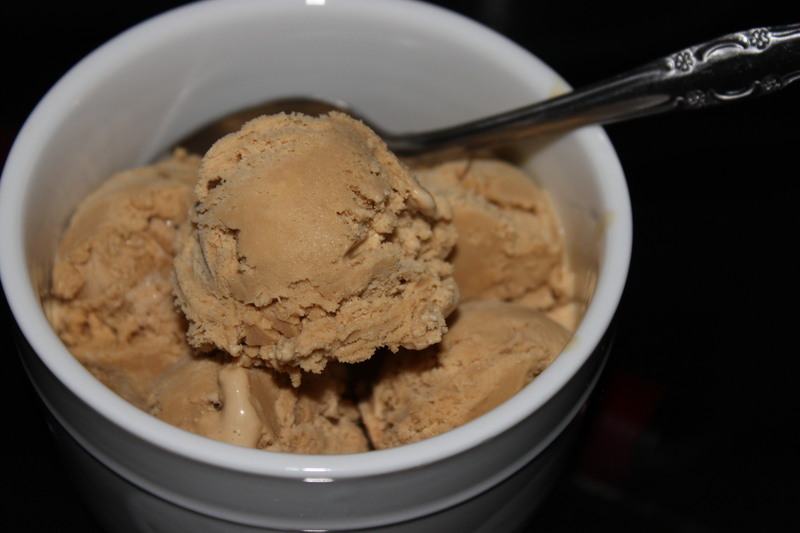 If you stop the caramel so soon, your ice cream will have the taste of sugar only, not the butterscotch taste. – As the butterscotch is done, add the whole milk and keep it hot but not boiling. – In a large bowl, beat the egg yolk until it has yellow pale color. Slowly add half of the hot milk into a thin stream to avoid the egg overcooked. Pour again the egg yolk mixture into the remaining hot milk. – In an inbetweener of low heat and medium heat, stir the custard evenly for 10 – 15 minutes. Use the spatula is a smart idea. Here’s an important trick when making ice cream. You want your ice cream as smoothly consistent as the store-bought ice cream. You also don’t want your custard boiled like a baby food. That’s why you have to keep the heat at medium low heat and stir frequently to prevent the custard from boiling. Just until the mixture coats the spatula and if unfortunately you see a slight lumps, stop cooking immediately. Your custard is done and would make the ice cream as thick as you dream. – Pour the custard through a mesh strainer. Keep refrigerate for 6 hours or overnight before pouring into ice cream maker. Do as the manufacturer’s instructions. – If you don’t have an ice cream maker, that’s not a big deal but cost you a little patience and labor. When the custard is ready, pour it into a thick and anti-leak plastic bag and freeze it for 3 hours. Remove from freezer, use your hand to massage the cream. Repeat it again for 3 times and your ice cream would be as delicious as it comes from the ice cream maker. This entry was posted in American, dessert, ice cream, sorbet. Bookmark the permalink.